That was the last thing I heard on the intercom as I shut down my helicopter on a beach at Camp Pendleton, California in the summer of 2012. The prior two minutes of flying had been some of the most intense of my life. A load of empty missile boxes which we were transferring by external sling load had swung up into the tail of our helicopter. It had happened so quickly that my crewman could only utter “Hey, what the–“ prior to impact with our Sikorsky MH-60S helicopter. Up front in the pilot’s seat, everything about that flight had felt fine until that moment. Then, all of a sudden, a large force rocked the airframe with a corresponding sharp jolt in my flight controls. Luckily, the load had hit the airframe and not the rotor system, which would have been catastrophic. Instead, quick crew coordination and proper emergency procedure execution resulted in our landing safely on the beach with no injuries to the crew. Our helicopter, though, did not come away unscathed. That hole my crewman found in the bottom of our $30M helicopter airframe cost more than $50K to repair and kept the aircraft off the squadron flight schedule for more than 2 months as it underwent repairs. 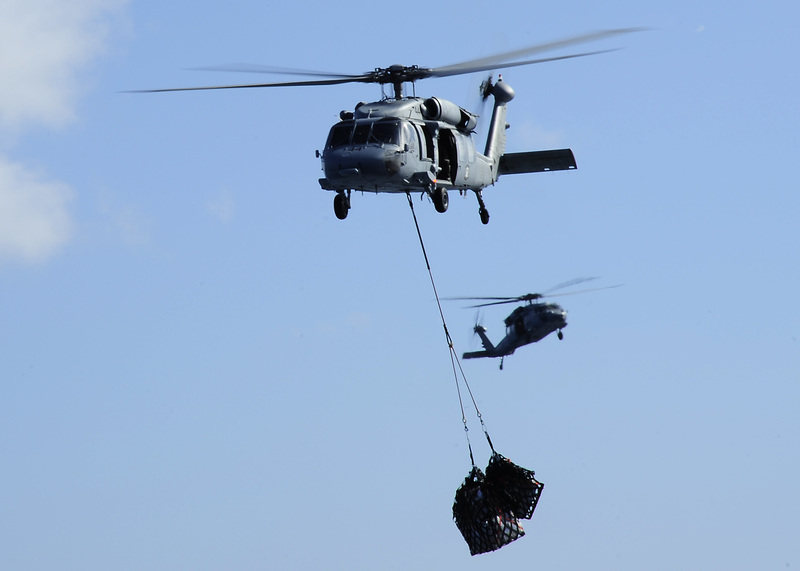 Transferring cargo by external sling load below a helicopter is a regular occurrence within military and civilian aviation. It is often quick, efficient, and safe. But many times one or more of those three elements can be missing, resulting in inefficient or unsafe operations that cost time, money, and lives. To better illustrate the problem from the military perspective, a brief discussion is warranted to explain what makes an external load unsafe or unpredictable. Helicopter sling load operations are done most efficiently when the load being transferred is dense, compact, and non-aerodynamic. The load we were transferring during our mishap flight was none of these. Instead, it was light, long, and highly-aerodynamic. This type of load has very little mass and inertia to counteract the aerodynamic forces developed on its large surface areas during flight. As a result, anytime you fly above 20 knots airspeed, the load can start to fly unpredictably, meaning it can rotate and swing uncontrollably. The only thing a pilot can do once a load begins to fly erratically is to slow down, fly an S-shaped flight path to “force g’s onto the load” using centrifugal force, and/or jettison the load. During our mishap flight, an aggravating factor was that the load had been rotating out of control on the cargo pendant (the extremely strong rubberized plastic device that links the cargo to the helicopter) but not exhibiting the normal erratic swinging of a light load. Instead, due to irregular cargo rigging, the excessive rotation caused the cargo pendant to wind up like a rubber band. As we slowed down crossing the beachline of Camp Pendleton, the reduction in aerodynamic force on the external load caused the pendant to rapidly unwind and cause the load to swing up into our helicopter. In fact, it happened so quickly that our crewman in the back of the helicopter had no time to jettison the load before impact, which is the standard procedure. Any ability to reduce or stop the rotation of this load prior to the incident would have prevented this mishap. 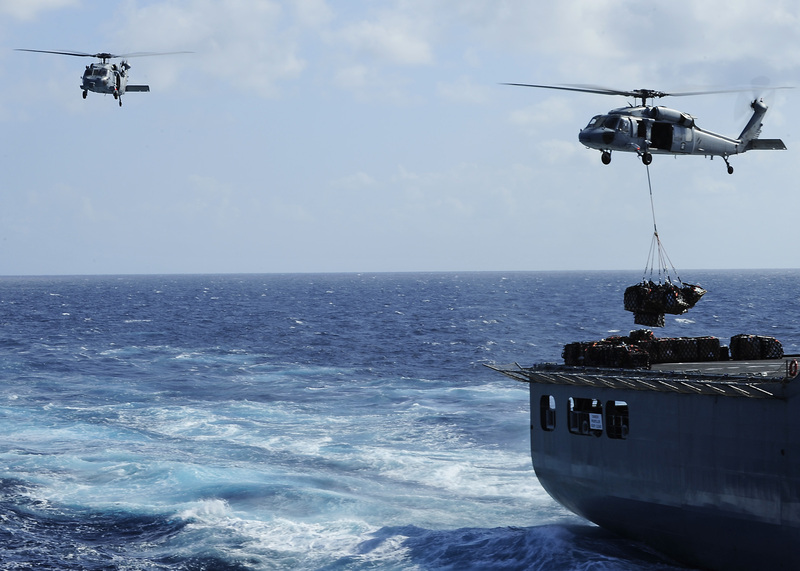 Helicopter Sea Combat Squadron TWO THREE (HSC 23) MH-60S helicopters delivering sling load cargo from a United States Navy supply vessel in the South Pacific while deployed in support of Operation Pacific Partnership 2011. A separate incident, a few months later while on deployment to the Middle East, highlights the inefficiencies that can occur during external load transfer. Our crew was transferring boxes of CH-53E rotor blades from a Navy supply ship back to our ship. Similar to missile boxes, rotor blade boxes are light, long, thin, and highly-aerodynamic. In short, they can be some of the most time intensive and dangerous items to transfer via helicopter. Any airspeed above 20 knots will result in uncontrolled rotation and swinging. Since ships conduct transfers-at-sea while steaming ahead at 10-15 knots, a helicopter barely has to begin forward flight before a load of rotor blade boxes start to act erratically. On this particular day, both ships were on tight operational timelines and began to put distance between themselves as they proceeded on mission. We tried to fly fast enough to cover the distance between the two ships as they steamed apart, but each time we increased speed the blade boxes began to swing dangerously. Eventually, both ships had to slow down and delay their follow-on missions so that we could complete the cargo transfer. A device that could have counteracted the swing would have resulted in a faster cargo transfer and allowed the ships to proceed on mission sooner. It is difficult to believe that over the past 79 years of helicopter operations no materially important technologic improvements have been made to helicopter sling load operations. The incidents that I described above have occurred to many other Navy aircrews in the past and remain a problem to this day. Videos abound on YouTube illustrating the same issues being faced by aircrews in the other military armed services. Two MH-60S helicopters from Helicopter Sea Combat Squadron TWO THREE (HSC 23) performing Vertical Replenishment (VERTREP) operations in the South Pacific while deployed in support of Operation Pacific Partnership 2011. But that is about to change…….. The team at Vita Inclinata Technologies is the first to successfully demonstrate a Load Stability System [Video Here] that can attach to the cable of a suspended load and effectively counteract rotation and pendulum swing. With Vita’s technology, the types of incidents I previously described will be a thing of the past. The ability to precisely and effectively control an external load will save millions of dollars by preventing potential airframe and cargo damage. Plus, operating efficiencies gained by moving external loads faster and more accurately will tally up to significant cumulative savings on fuel and airframe maintenance costs. No, but I might be one of the last. Today’s post was written by Brian Miller, Vita’s Aviation Advisor and former U.S. Navy MH-60S helicopter pilot. Brian is an aviation enthusiast and active general aviation pilot. He has logged over 1060 flight hours in eight different airframes. As an MH-60S pilot he logged 800 hours of flight time and transferred more than 700 loads of external cargo in operational missions. 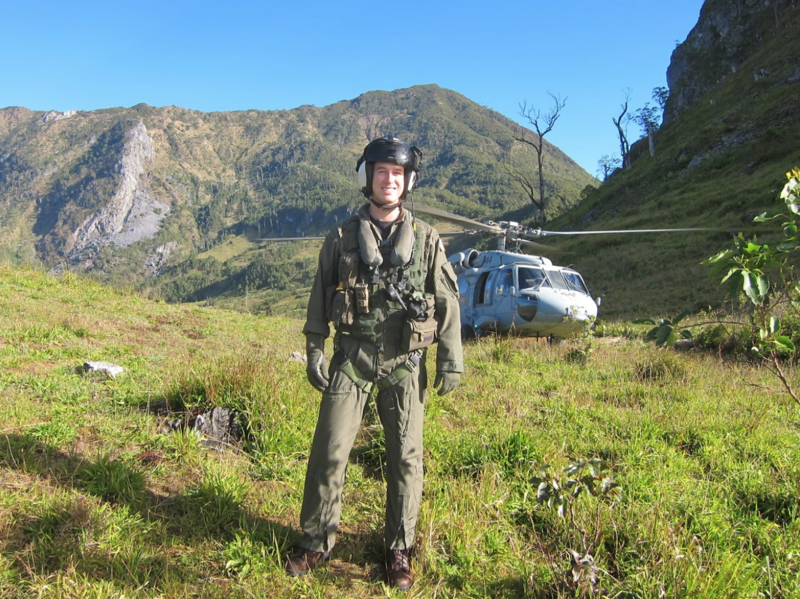 His goal is a future where Vita’s technology is standard mission equipment to improve the safety and efficacy of helicopter external load and rescue hoisting operations. Previous Post Vita Pitches to NASA tonight! Next Post Edge 3 Voting!